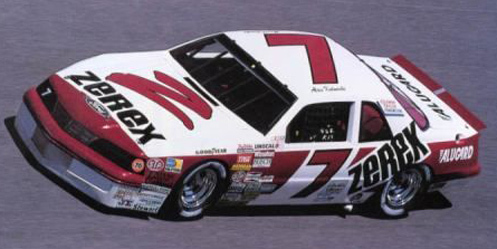 Alan Kulwicki picked up the 1st last-place finish of his NASCAR Winston Cup career in the Southern 500 at the Darlington Raceway when his #7 Zerex Ford lost the engine after 77 of 202 laps. The finish came in Kulwicki’s 49th series start. One of the many measures of Kulwicki’s legacy in NASCAR can be seen during Darlington’s “Throwback Weekend.” Last year, both Roush-Fenway Racing and Tommy Baldwin Racing ran near-identical tributes to the “Underbird,” the Hooters Restaurants Ford that Kulwicki piloted to his improbable 1992 Winston Cup Championship, with Greg Biffle running the sponsor and Regan Smith carrying #7. This year, Michael McDowell and the Leavine Family Racing team will enter a #95 Chevrolet reminiscent of the black-and-gold #35 Quincy’s Steak House Ford the Wisconsin driver wheeled to a Rookie of the Year victory over Michael Waltrip. On the XFINITY side, Ryan Reed’s #16 Lilly Diabetes Ford will resemble the Zerex Ford that Kulwicki took to victory lane at Rockingham in 1990. It's also interesting to note that only once did Kulwicki finish last in 213 combined Cup and XFINITY Series starts – a finish that also came at Darlington in the Labor Day Classic. 1987 marked Kulwicki’s third season in Cup, and the first year where he ran all the races. It was also the first full year Kulwicki was listed as the owner of his own team, having acquired the assets from Bill Terry’s team prior to Darlington the previous year. For the new season, Kulwicki changed his car number from #35 to #7, all the while welcoming new sponsorship from Zerex Antifreeze. The white-and-red scheme and bold door numbers would remain largely unchanged for the rest of his Cup career. Through the first 20 rounds of the 1987 season, Kulwicki was steadily becoming a contender for victories. He earned his first pole at Richmond in March, tied his career-best finish at North Wilkesboro with a 4th-place finish, then went toe-to-toe with Dale Earnhardt at Pocono in July before he settled for the runner-up spot, just one second behind the eventual season champion. Coming into Darlington, where he’d finished 14th in the spring, Kulwicki had finished no worse than 11th in three of his previous four races. 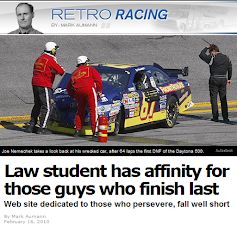 Yet he sat just 15th in the point standings, saddled by eight DNFs, including a streak of five in a row. One of the storylines coming into the 1987 Southern 500 involved the race’s defending winner. Sidelined with an illness that was only called “double pneumonia,” Tim Richmond returned to the Cup circuit in June, earning back-to-back victories in his first two starts of the season at Pocono and Riverside. Richmond had made another six starts since then in Rick Hendrick’s fleet #25 Folger’s Coffee Chevrolet, most recently at Michigan that August, where a blown engine left him 29th. The Southern 500 was to be Richmond’s next start, but his ailment had exacted its toll. The Thursday before the race, Richmond was withdrawn from the event, never to run again. He would succumb to AIDS less than two years later. Another continuing story of 1987 came in qualifying, where Davey Allison earned his fourth pole of the season. Already, the second-generation racer had scored two victories at Talladega and Dover, setting a rookie record for wins that would stand until Tony Stewart’s three-win debut in 1999. Allison had struggled at the track where his father Bobby had won five times, crashing out in both his previous starts. That March, following a repave at the track, Davey had wrecked again, setting his car aflame. Bobby leaped from his car and helped his son escape. Davey would lead 86 laps of the 1987 Southern 500, only to crash for a third-straight race, leaving him 29th. 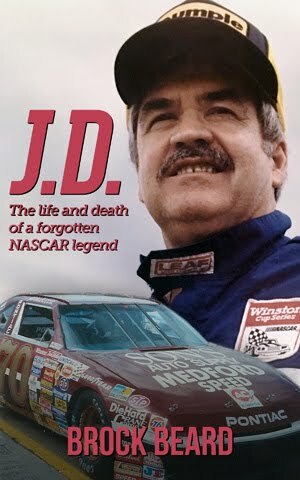 He would go on to score two runner-up finishes at “The Lady In Black,” and arrive there in 1992 with a chance at “The Winston Million,” but the victory eluded him up to his own tragic passing in 1993. No driver was in position to win the “Winston Million” in 1987 as the other three “crown jewel” races were won by three different drivers. Joining Davey Allison’s win in Talladega’s Winston 500 were Daytona 500 winner Bill Elliott and Coca-Cola 600 winner Kyle Petty, all three drivers eligible to take home $100,000 for a win at Darlington. Petty, who started 26th, had the farthest to go as both Allison and Elliott rolled off on the front row. Kulwicki, meanwhile, qualified 6th in the 40-car field. 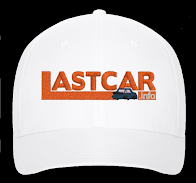 Starting last that Sunday was the #6 Slender You Figure Salons Oldsmobile of Tennessee native Connie Saylor. Saylor, a part-timer in the series in his tenth season, was nearing the end of his career when he rejoined D.K. Ulrich’s team midway through the ’87 campaign. It was also his tenth Cup start at Darlington, a track where his best finish was a 14th in 1980 driving for G.C. Spencer. Persistent rain delayed the start of the race, and the 40-car field spent several pace laps under caution, then another 24 circuits under a green / yellow start due to drainage from the grandstands coming down the front stretch. During those laps, Brett Bodine, Jimmy Means, Dave Marcis, and Mike Potter stopped to top off their fuel tanks, dropping all four to the tail end of the field for the green-flag start on Lap 25. On Lap 34, the leaders caught the new last-place runner, South Carolina owner-driver Jonathan Lee Edwards, whose #32 Edwards Racing Chevrolet was the first car to go a lap down. The 29-year-old Edwards, making his eighth and final Cup start, had competed in both the Twin 125s and the Winston Open for the first time that year, and would leave the sport without a single last-place finish. Joining Edwards at the back of the field was Geoffrey Bodine, whose #5 Levi Garrett Chevrolet lost two laps after an unscheduled pit stop. It was the latest in a series of frustrations for Bodine, whose Hendrick Motorsports-prepared Busch Grand National car was withdrawn from the previous day’s race due to an illegal carburetor. Kulwicki went behind the wall with engine trouble after 77 laps, just as the first round of green-flag stops had completed, handing him the last-place finish. The remainder of the Bottom Five included a mix of Cup Series winners and underdogs. 39th that Sunday went to Harry Gant, who burned the clutch on his #33 Skoal Bandit Chevrolet, then fielded by film director Hal Needham. 38th fell to Greg Sacks, who lost the engine on the Dingman Brothers’ #50 Valvoline Pontiac. Finishing 37th was Jonathan Lee Edwards, followed by 36th-place Trevor Boys, the Canadian in his sixth season of competition, after his #12 Gorman’s Esso Oldsmobile wrecked out of the race. The race was cut short by rain after 202 of 367 scheduled laps, just moments after Dale Earnhardt made the winning pass on Richard Petty. Much of the rest of Kulwicki’s career is well-known. He’d have to wait just over a year to take his first “Polish Victory Lap” after taking the win in the inaugural Checker 500 at Phoenix International Raceway, then another two years for his second win at Rockingham. Zerex left the team in 1991, and only a strong start to the season, combined with a DNQ by Mark Stahl, later secured him sponsorship from Hooters. The next year, he’d rally from a crash at Dover and make up a 278-point deficit to edge Bill Elliott for the Winston Cup. But, just five months later, after rolling to 9th in the 1993 standings heading to Bristol, Kulwicki lost his life in a private plane crash. 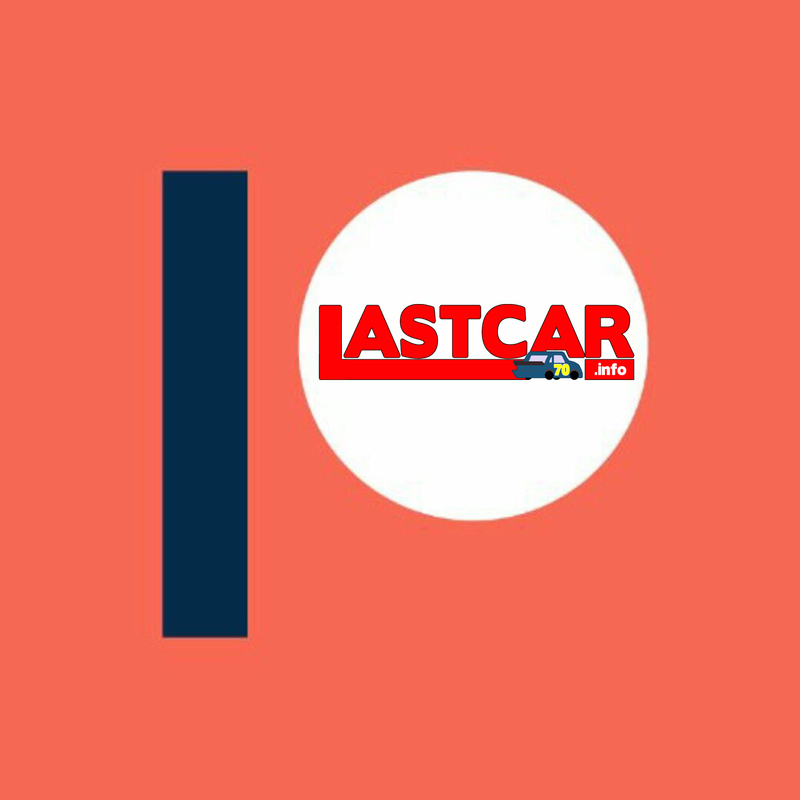 *This marked the first last-place finish for car #7 in a Cup Series race since August 23, 1986, when the engine let go on Kyle Petty’s 7-Eleven Ford during the Busch 500 at Bristol. It was the first last-place finish for the car number at Darlington since September 2, 1968, when Bobby Johns’ 1967 Chevrolet burned the clutch after 1 lap of the Southern 500. As of this writing, these are the only two Cup races at Darlington races where #7 has finished last.